Google Lat Long: Cricket Season Has Begun! “The Ashes,” a tournament series played between England and Australia, recently began a couple weeks ago so the competition is underway. It’s said to be international cricket's most celebrated rivalry, dating back to 1882. The series is played biennially, alternating between the United Kingdom and Australia. Since cricket is a summer sport, and the venues are located in opposite hemispheres, the break between series alternates between 18 and 30 months. In Australia, where the tournament is being played this year, the “grounds” (stadiums) used are "The Gabba" in Brisbane, the Adelaide Oval, the WACA in Perth, the Melbourne Cricket Ground (MCG) and the Sydney Cricket Ground (SCG), in that order. 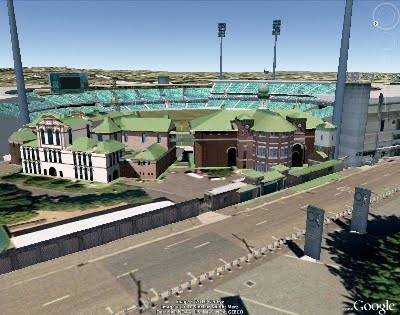 So whether you’re a cricket newbie like me, or a veteran “cricketer,” we hope that you’ll explore all of these grounds in Google Earth, or just enjoy our video tour, today! Summer has arrived in the southern hemisphere, which in Australia, means cricket!